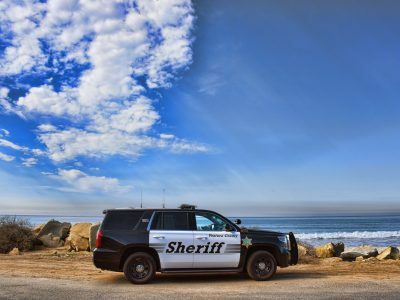 The West County Police Services/ Headquarters Station serves the communities of Saticoy, El Rio, Nyeland Acres, Montalvo, Silver Strand Beach, Hollywood Beach and the La Conchita Beach areas. It also serves the unincorporated areas surrounding the cities of Oxnard and Ventura. The station serves approximately 17,500 residents and patrols approximately 80.5 square miles. There are a total of 29 sworn and four civilian support staff assigned to the station. There are also two civilian volunteers who donate their time assisting staff. Each patrol shift consists of a minimum of three deputies and one sergeant as the acting supervisor. During the week, there is also a school resource officer who handles any incidents that occur at Rio Mesa High School and Rio Del Valle Middle School. The Headquarters Station has a liaison deputy assigned to each of the communities previously listed. They regularly attend monthly community council, municipal advisory committee and board meetings in an effort to assist residents with problems that arise in that specific area. The station also has a graffiti abatement program. Staff from this station work in conjunction with Oxnard Police Department in getting graffiti painted over in a timely manner. The Headquarters Station has an active Explorer program. The program is associated with the Boy Scouts of America. There are currently 13 youth who are involved with the station’s post. Two deputies assigned to the station serve as youth advisors. The Sheriff’s Gang Unit is also located at the Headquarters Station. The unit serves many communities in assisting with law enforcement and apprehension of gang members who terrorize the communities they reside in. The unit consists of eight sworn and one civilian support staff.